Drawing on the success of two previously held international scientific summits, the GW Office of International Medicine Programs (IMP) and the School of Medicine and Health Sciences (SMHS) organized a third in December; this time convening GW researchers with colleagues in Madrid to focus on increasing research collaborations between the United States and Spain and developing the global physician-scientist workforce. The summit was a success, according to Huda Ayas, associate dean for international medicine and executive director of the GW Office of International Medicine Programs (IMP). 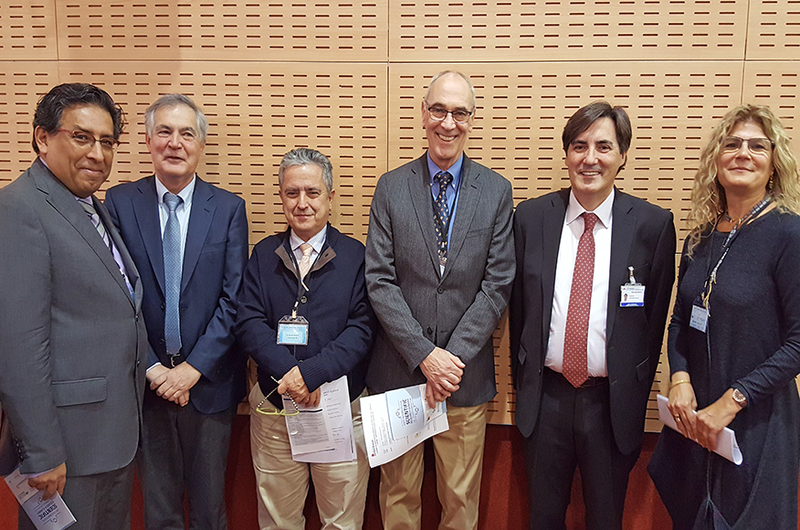 The summit was developed by the GW Cancer Center, GW School of Medicine and Health Sciences researchers, and IMP, alongside Spanish co-sponsors Puerta de Hierro Hospital and Research Institute and the Universidad Autonoma de Madrid. Researchers from the Cajal Institute and the Catholic University of Valencia also participated. About 14 GW faculty and staff members attended the two-day event, which included keynote addresses, a session on educational and scientific goals, concurrent sessions on oncology and neuroscience, as well as a joint session focusing on neuro-oncology. Eduardo Sotomayor, MD, director of the GW Cancer Center, said one goal of the summit was to find common areas of biomedical interest between the institutions that could lead to strong collaborations. At the end of the summit, areas that emerged for partnership consideration included liquid biopsies in lung cancer and other solid malignancies, biology and immunotherapy of lymphomas, and skin malignancies, said Sotomayor. In addition to Sotomayor, Robert H. Miller, PhD, senior associate dean for research and Vivian Gill Distinguished Research Professor at SMHS, contributed to the development and oversight of sessions in the neurosciences. One driver of the meeting was the search for potential mentors for GW Global Physician-Scientists (GPS) Pathway students. The program, part of IMP’s recent effort to address the shortage of physician-scientists, enables students to begin their research at GW and continue it in Spain through an eight-week summer internship early in medical school and later through a one-year fellowship. The key for this initiative, added Sotomayor, is the “ongoing collaboration among investigators on both sides of the Atlantic, which will allow students to focus on projects shared by American and Spanish investigators. “We are trying to be innovative in education and this is one of the ways we’re doing that,” he said. Fernando Vidal-Vanaclocha, MD, PhD, chief science officer at the Catholic University of Valencia’s School of Medicine, also played a critical role in the development of the summit and the GPS Pathway. Vidal-Vanaclocha said the summit was an “incredibly unique” experience, and noted the importance of growing collaborations with the United States, instead of just within the European continent, which is more common. In addition, he said improving global physician-scientist research education is top of mind for him. “We educate many physicians, but not physician-scientists,” he said of Spain. The summit was the first for IMP in Spain, but not the first of its kind overall. Successful summits also have been held in Thailand and Brazil — with more to come. IMP is open to assisting GW faculty members who wish to set up their own international meetings either abroad or here at GW. For more information on the services and support IMP can provide, faculty are encouraged to contact IMP’s program manager and international liaison Rachael Fellabaum at impinfo@email.gwu.edu or 202-994-2796.